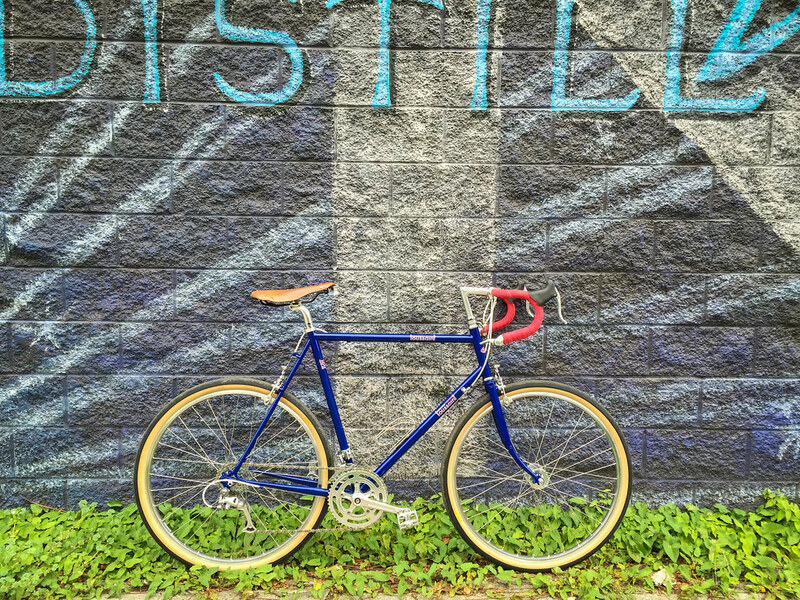 Our northern buddies at Cycles Toussaint in Calgary have introduced a new Vélo Routier. I took one out for a spin to see how it compared to my v1 bike. My first impression was that it felt just like my Vélo Routier. I’m not sure that I would be able to tell the difference in a blind test. It felt planted and quick steering. Comfortable, not quirky. 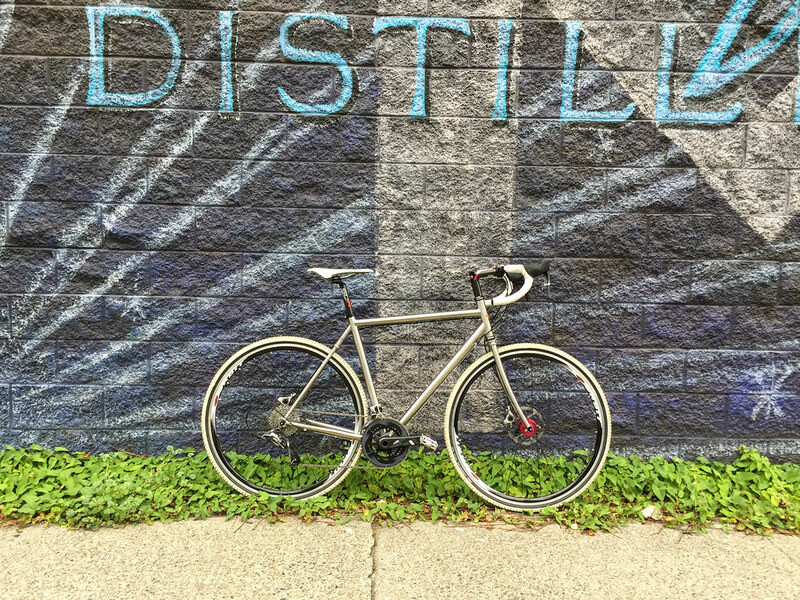 This was set up similar to my own bike, with a Selle Anatomica, Noodles, bar-end shifting, and Compass tires. This geometry just works for me. Nice bike, great brakes. 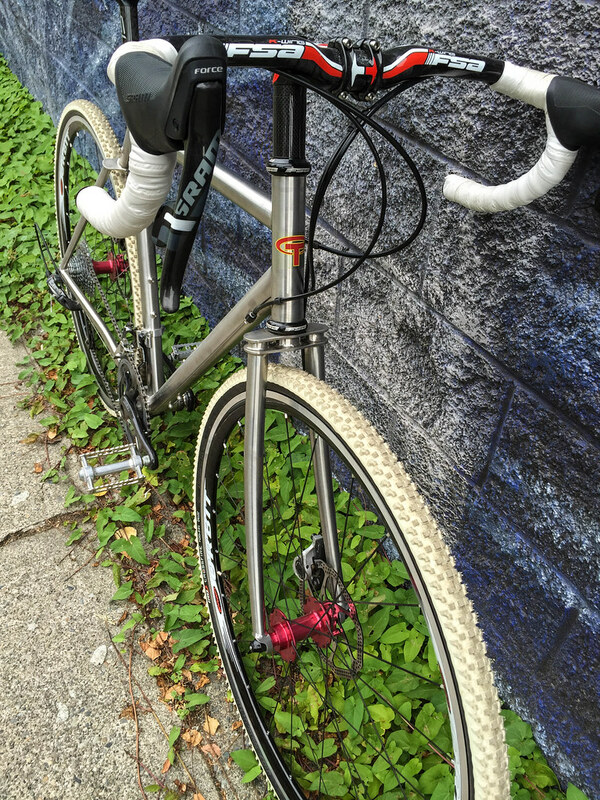 They offer the v2 in 2 versions – one with braze-ons, and one without. I really like the braze-on centerpulls and the quirky seat-stay pump mount, so that would be my choice. The blue color is a nice change, too. 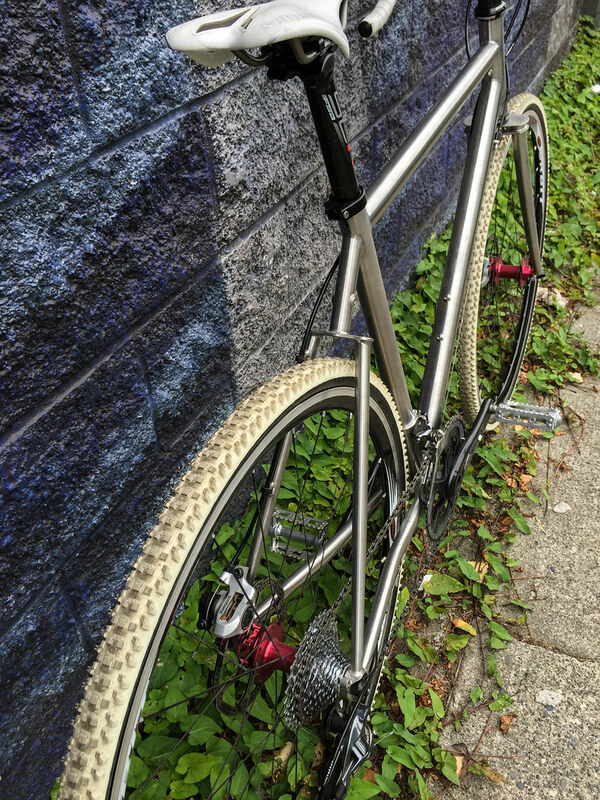 One new quirk – there is a slotted rear axle mount now, to better accommodate IGH or fixed/single gear hubs. While this opens up the bike to more options, it may make bikes with fenders tougher to change out a flat on, but there are ways around the problem. The next bike is a demo that is a new direction for Toussaint. I believe this is an all-round road/gravel, maybe even cross bike. It was set up racier than I would typically ride, but it was surprising in a number of ways. The tubing is all stainless steel, which gives it a fairly “ti” look. The downtube is quite oversized, as well, at 38.1mm. This seems overly stiff for my weight range, but can be offset with cushy tires. It is spec’d to take a 45mm fender, so I would assume you could put the Compass Barlow Pass tires on with no problems. It looks like a Clement MSO would fit fine for a bit more bite. Toussaint used interesting plated fork and seat stay crowns. I like the classic low fork bend of the Routier more. To my eyes, it would be a great match for the double plate crown on this bike. The “banana” bend just looks odd to me. I assume it makes the disc attachment easier/stiffer, but if the bike could use a more classic bend here, it would be prettier. Disks make it a great utility rain bike. I found the bike to be quite like the Vélo Routier in feel – even with a bit more trail on the Pavé (45mm). It still felt quick steering, and was light and fun to ride. I was wondering how it would be with some front or rear load. I may see if I can get an extended trial to find out. After the ride, I am hopeful this bike would fall into a similar price range as the Vélo Routier – if you could get a bike built for the rainy NW commute, not have to worry about rust or wet brakes, and still maintain great geometry that would handle randonneuring or lightly loaded gravel adventure rides – nirvana, right there! The Toussaint blog (with lots of good info on the tubing, geometry, etc…) is saying they hope to sell these for around $2000, so I guess the tubing makes a big difference, but we’ll see what happens if they do a production run. This is a cool, practical bike! One of the biggest dilemmas for me this year was the choice of shoes/pedals for the Oregon Outback. I have had great luck with clip-less pedals and Sidi cycling shoes, so going with flats felt like a big risk. I knew that we wouldn’t go more than 100 miles in any one day, but we would be doing it for 4-6 days straight. On the other hand, I didn’t relish the thought of running around in cleats on rough ground for the better part of a week. They add a certain amount discomfort: slippery footing in some situations, and “duck walking” on the ground. They also introduce unnecessary complexity and technical failure risk if a cleat gets damaged, or a shoe gets lost. On flat pedals, at least I could comfortably use sandals or bare feet (in a pinch). I rode on flats for the most part all winter and spring before the ride, with a max distance of about 50 miles. No problems. I have had occasional knee pain that has developed in the past over longer miles, but I was not as worried about it in this case. Both my clip-less setup (SpeedPlay Frogs, Sidi Spider SRS) and flats give my knees plenty of float. I seem to have had the most pain on a relatively locked in SPD setup. Long story short – flat pedals were great, thin approach shoes were comfy as hell. Pedals: Watch your shins on these pedals – they are grabby and have sharp edges, but after a few nicks, you figure out how to stay away from them. They lock your foot in really well – there were quite a few “holy crap” bumpy, loose, fast downhills we had to traverse, and I never lost my foot on the pedal – something that has happened to me on other pedal/shoe combos, and scary when you are rocketing downhill on single track or loose fire roads. These guys just work, and have a large platform to find purchase on. I also used some Echo sandals for part of the day when we were in the hotter, more exposed sections of the trail, but I mainly went this route because I had gotten the Cruzers wet, and wanted to dry them out on the back of my bag. This is an added benefit of flats – spare footwear just works. That’s it for now. 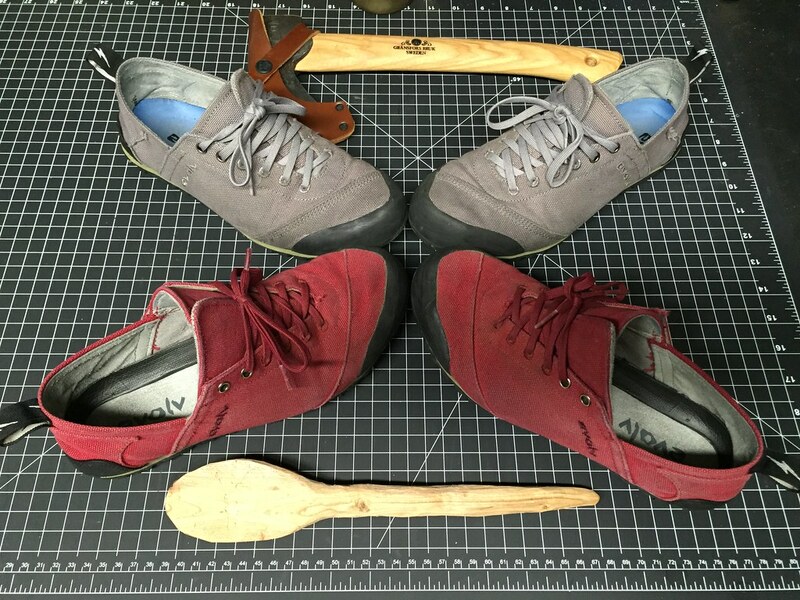 Let me know if you have found similar flat pedal/shoe combos you like.